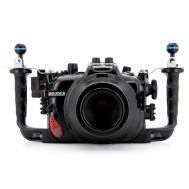 The NA-EM10MKIII underwater housing is sculpted to fit the E-M10 III camera like a glove, and extensive camera control ergonomic enhancements are made to ensure that the housing is as easy to use in water as the camera is on land. The third incarnation of the entry-level OM-D, the E-M10 Mark III adds stabilized 4K video to it's already notable 16MP Four-thirds CMOS sensor. For the still shooter the Mark III provides a snappy 8.6 fps continuous shooting, a 2.36M Dot OLED viewfinder and 121 selectable AF focus points. The added 5-axis sensor-shift image stabilization delivers up to 4.0 EV stops of stabilization allowing for buttery smooth video. The Mark III adds the ability to shoot UHD 4K at up to 30p with an approximate bit rate of 102Mbps and C4K at 24fps. A new cam lever system on the tray securely locks the camera in place, providing strength and precise positioning even when a heavy lens is mounted. The camera, with lens and zoom gear mounted, drops into the housing. 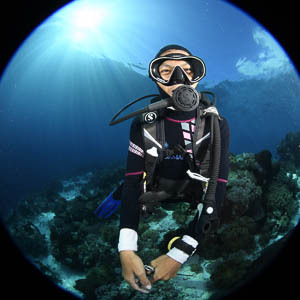 Stiffening, stainless steel handle brackets are included with the housing, providing a solid "wobble free" attachment when using Nauticam Flexitray (PN 71207) and Easitray (PN 71206) with heavy lighting systems. Multiple lanyard attachment points are included in the brackets. A large, rubberized zoom and focus control knob provides easy lens control with excellent tactile feel. The NA-EM10II housing is designed for a right hand on the grip shooting style, but this isn't always the best solution for users with very large hands, or in cold water with thick gloves. Our shutter release extension was designed to enhance ergonomics in these configurations, and is included with every housing at no charge.